by Henry F. Carey. Santa Barbara, CA: Praeger, 2012. Hardback. $59.10. ISBN: 978-0-313-36615-4. The U.S. wars in Afghanistan and Iraq presented challenges to our security and our identity. There is clear evidence that the U.S. engaged in, and justified, torture. While security needs of a nation are high, such policies betray a commitment to the rule of law. Henry F. Carey , an associate professor of political science at Georgia State University, specializes on international criminal justice. This book is one of six he edited, coedited, or wrote himself in 2012. He utilizes documents, reports, interviews, testimony of officials before international organizations to examine the extent to which four nations ‒ the United States, Israel, France, and Argentina ‒ have enacted reforms following periods in which torture was employed. Carey indicates that his own interest in topic came after a 2003 debate about the George W. Bush administration’s torture policy in which his father was a participant. The Preface and Chapter 1 identify the purpose of the research. Carey makes it clear from the outset that his study aims to enhance human rights and democratic accountability. He supports a zero-tolerance policy toward torture, which he labels “probably the most important human right to monitor and pressure for coercion, with the possible exception of genocide…” (p.11). Unless the international community rallies for reforms, the personal and institutional ramifications of torture will continue to negatively impact those nations which adopted it. Chapter 1 analyzes torture from several perspectives. These include an overview of facts about torture, state motives for torture, types of torture, and philosophical approaches to the use of torture. Chapter 2 contains the first of four case studies and highlights the United States experience with torture during the post 9-11 period. Carey details how officials in the George W. Bush administration sought to legalize torture in 2002 and how Congress and the courts largely stood by, at least at first. Techniques normally associated with torture were authorized at Abu Ghraib prison in Iraq, at CIA-run secret detention sites in several nations, and at Guantanamo Bay Naval Base prison in Cuba. A combination of leaks, court challenges, and legislative intervention resulted in the practice being scrutinized and limited, but torture was not officially prohibited until Barack Obama was inaugurated as American president. Still, Carey notes that President Obama has continued indefinite detention of suspected terrorist and has not closed the “Gitmo” prison. Overall, reforms were [*551] minimal, officials still deny that torture occurred, and accountability for such actions is missing. Chapter 3 focuses on Israel’s use of torture in dealing with Palestine Liberation Organization (PLO) fighters. Of the four nations studied, Israel has the most security risks and threat of terrorism against it. Carey points out the Israeli Security Agency interpreted the Convention against Torture in a manner that permitted extreme techniques. After torture increased during the 1990s, opponents became more aggressive in seeking controls. A 1999 High Court of Justice ruling which referred to torture as cruel, inhuman, and degrading indicated a pattern of increasing judicial review of torture cases. Further, Israeli authorities have demonstrated a willingness to investigate allegations of torture and to work with non-government organizations concerned with the practice. Though Carey faults Israel for lacking a public debate on torture, he notes that its record in this area is better that of the United States. France’s employment of torture in Algerian War of Independence from 1954 to 1962 is covered in Chapter 4. The conflict there occurred immediately after France’s withdrawal from Vietnam following a military defeat, though its past use of torture at home and general hostility to minority religions may also explain its resumption. After that period, French authorities signed on to a plethora of international agreements prohibiting torture, including the Committee to Prevent Torture, European Convention on Human Rights, Council of Europe, and the UN Subcommittee on Torture among them. Consequently, there are no contemporary charges of torture against France. However, France has not admitted torture and has less than an independent relationship between the judiciary and security agencies, both of which reduce likelihood of improvement in accountability. In Chapter 5, Argentina’s utilization of torture against opponents is chronicled. It is generally agreed that torture occurred during the decade between 1973 and 1983, which coincided with the return of power by Juan Peron , rule by Peron’s wife after his death in 1974, a 1976 military coup, and military control of the government until civilian power was restored. During this period, as many as 30,000 opponents were killed, 10,000 were held as political prisoner, and 300,000 became political exiles. Though seemingly the most brutal in torture techniques adopted among the nations studied in the present book, Argentina likewise progressed the most in documenting its use, remembering victims, and punishing transgressors. For instance, the nation has embraced academic conferences, memoirs, and truth commissions as a way to discover the extent of torture and killings; it has memorialized the victims by way of a Wall of Memory, a Park of Memory, and an institute; and has tried and convicted almost two hundred persons for their role in the violence. Argentina has seemingly accepted responsibility for its past use of torture and has taken a stand against terrorism, but is still on the list of nations which condone torture and is subject to weak oversight by non-government organizations. Chapter 6 has a long title, but is best understood as another section scrutinizing American utilization of [*552] torture. Carey discusses torture by the United States in the Philippines insurrection of 1900-1902, in the Vietnam War, and against detainees following the 9-11 attacks. Additionally, the causes and motives for torture are presented. Other evidence and examples found here convincingly show the practical limitations of torture for obtaining accurate information. 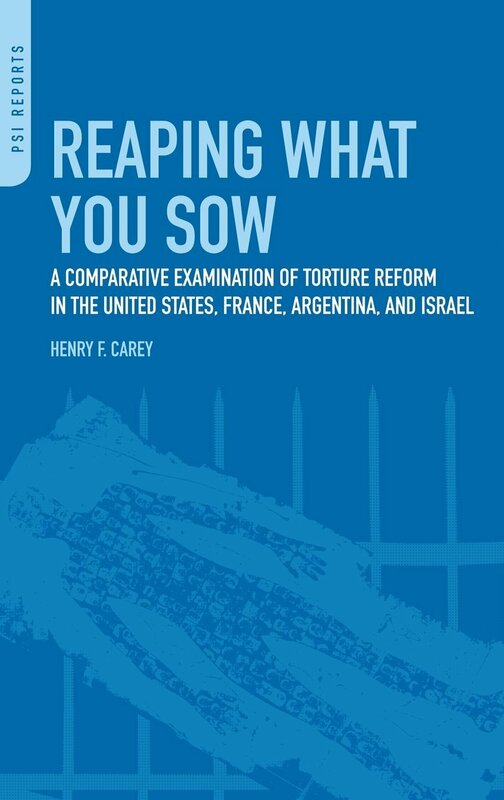 In the final two chapters of the text, Carey synthesizes findings and uncovers patterns in torture use and subsequent reform attempts. First, he differentiates between torture used domestically (Israel, Argentina) from that practiced away from the home nation (America, France). Second, he categorizes types of torture by level of physical marks left, referring to the distinction between “branding” with marks (France, Argentina) and “clean” torture which does not leave clear physical traces (America, Israel). Third, he notes which countries among the four in the book attempted torture reform during war (America, Israel) and which sought reform in a state of peace (Argentina, France). Based on the latter features and additional criteria, Carey concludes that America and Israel form one pair and Argentina and France the other and more progressive duo in limiting torture. Carey concludes the book by asserting that a “heroic effort, not to withstand torture but to abolish it, is needed now, before the next terrorist attacks make it too late for history” (p.268). A review of literature on the subject of torture reveals some studies which have concentrated on instances of torture within each of the four nations investigated by Carey and a few which have endeavored to make cross-national comparisons. Books by Marguerite Feitlowitz (2011), Melissa Phillips (1995), Alfred McCoy (2006), and Lisa Silverman (2001) probe torture use by Argentina, Israel, the United States, and France, respectively; the latter two books focus on a longer time frame than the first two. Harold Rudolph’s 1984 work examines torture and detainee rights in South Africa and Israel. Craig Scott’s (2001) edited book assesses transnational tort litigation as a way to respond to torture. More recently, Jinee Lokaneeta’s 2011 study compares torture and state power in the United States and India; this book is closest to the Carey text in length. Carey’s book is perhaps the most ambitious cross-national comparison of torture and torture reform to date. His visits to the nations under study and his past research record added to the quality of the information relayed. Nonetheless, a few shortcomings exist. Organizationally, Carey could have divided the material in Chapter 6 among previous chapters outlining types of torture and American use of the tool. Further, some statistics ‒ such as on number of detainees remaining at Gitmo ‒ appear more than once but with different tallies. Finally, the author’s relentless critique of America-sanctioned torture ‒ while understandable from the evidence, and from his perspective on the need to abolish torture ‒ may be too negative for those not persuaded that there is no difference between “enhanced interrogation” and torture, or that torture is in all circumstances unjustifiable. The indisputable message of Carey’s book comes from the author himself: [*553] “To oppose torture is to fight for the values of civilization, not those of terrorists” (p.210). Feitlowitz, Marguerite. 2011. A LEXICON OF TERROR: ARGENTINA AND THE LEGACIES OF TORTURE. New York: Oxford University Press. McCoy, Alfred W. 2006. A QUESTION OF TORTURE: CIA INTERROGATION, FROM THE COLD WAR TO THE WAR ON TERROR. New York: Henry Holt and Company. Phillips, Melissa. 1995. TORTURE FOR SECURITTY: THE SYSTEMATIC TORTURE AND ILL-TREATMENT OF PALISTINEANS IN ISRAEL. Ramallah, West Bank: Al Haq Publishers. Rudolph, Harold. 1984. SECURITY, TERRORISM, AND TORTURE: DETAINEES’ RIGHTS IN SOUTH AFRICA AND ISRAEL: A COMPARATIVE STUDY. Claremont, South Africa: Juta Publishers. Scott, Craig, editor. 2001. TORTURE AS TORT: COMPARATIVE PERSPECTIVES ON THE DEVELOPMENT OF TRANSNATIONAL TORT LITIGATION. Oxford, England: Hart Publishing. Silverman, Lisa. 2001. TORTURED SUBJECTS: PAIN, TRUTH, AND THE BODY IN EARLY MODERN FRANCE. Chicago: University of Chicago Press. Copyright 2013 by the Author, Samuel B. Hoff.